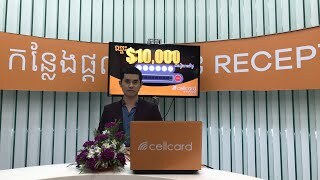 Cellcard gives away $10,000 every day. Too good to be true? Well it is true. Each day happy customers walk away with funds that help them in their daily lives. We ask our winners what they will do with the money. Some pay off debts, others buy new motors and some put the money towards their children’s education. Whatever your needs, let Cellcard’s $10,000 raffle help. If the $10,000 is not claimed it rolls over to the next day giving a prize pool of $20,000! To join call 8888 or SMS “10K” to 8888 and receive your 6-digit raffle number. 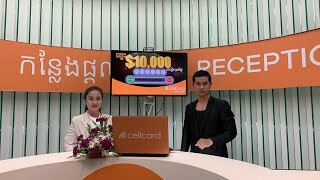 Catch the lucky draw will be broadcasting real-time on Cellcard’s You Tube Channel from 6:00 pm every day. The promotion will offer until further notice. Please note, this offer is set on auto-renewal to ensure you have uninterrupted enjoyment of the service. Your subscription will be automatically deducted from your main balance. Auto-renewal of 10K raffle will be 20 cents per day. This promotion is applicable for all Cellcard prepaid and postpaid subscribers. Once you call or SMS to 8888, you will be charge dialy subcription of 20 cents and get 1 lucky code daily. The winning number will be a computer generated 6-digit number which will be issued against a mobile number that is participating in the raffle. It will not be the mobile number of the customer. Daily cut-off for getting an entry (6-digit number) is from 17:00-19:00. No tickets will be issued during this time. Call or SMS to 8888 during this time will not be charged. In case where there is no winner drawn for the day, the daily cash prize will be rolled over and added to the next day’s prize and will continue until a winner is found. Winners will be notified via 077 999 197. What is $10K daily raffle promotion? It is a special promotion that allow Cellcard customers to get a chance to take home $10,000 in cash every day. How much will it charge per SMS or call to 8888? When the lucky draw will be started? Where? How can I know I am a winner?